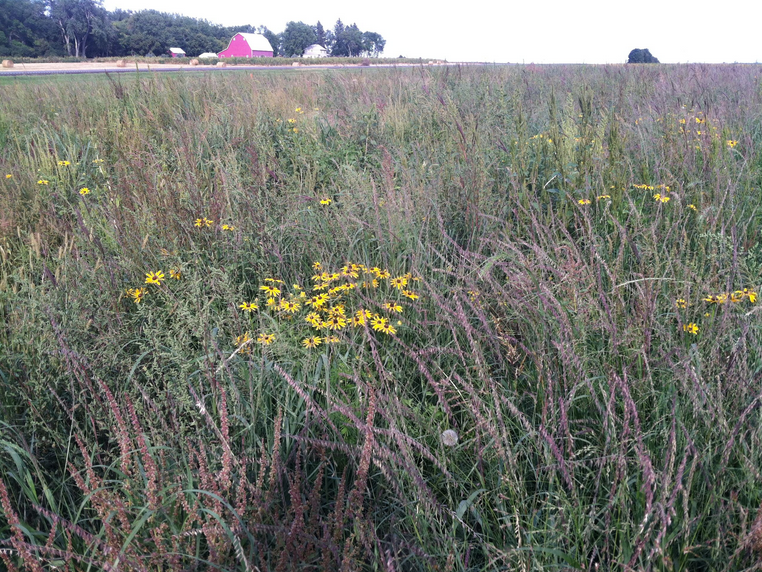 Native grasses on SDSU’s Northeast Research Farm grow in marginal crop ground converted to grass. Courtesy photo. With the low price of commodities, many producers are struggling to cover input costs. And with the goal of netting a profit, some farmers are choosing to convert marginal cropland back to grass. In 1996, Jim and Karen Kopriva, who live at Raymond, S.D., in the northeast corner of the state, bought some farm ground with the intent to farm it till it was paid for, then put it into pasture. They kept good records, tracking input costs and net profit for the first three years. The first year, it made $12 an acre; the second year, it cleared $14, and the third year it made $16 an acre. The Koprivas were renting pasture for their cattle at $20 an acre, which wasn't optimal for more reasons than just the cost. "When you rent grass, you inherit poor fences and abused grass conditions," Kopriva said. "Then you fix it up and get the grass healthy, and you lose it to somebody who outbids you." So for him, it made sense to take crop land that wasn't making money and put it into grass. "We're not sorry one bit we did that," he said. "It became abundantly clear that it was not going to pay for itself with grain production, ever." Kopriva did some research, talked to some agencies, and decided to take 207 acres of level ground and plant it to native grasses: big bluestem, Indiangrass, switchgrass, and sideoats grama. The seed was expensive, so he searched around for cost share opportunities. The South Dakota Department of Game, Fish and Parks had a program that covered the cost of the seed if he would make a commitment to leave it in grass for ten years. After ten years, he could do what he wanted with it. During the ten years, he could hay it, but not until after July 15, when the primary nesting season ended. He agreed. "They plunked down $40,000 for me to buy grass seed with," he said. He planted it and it grew. The weeds came the first couple years, mostly broadleaf, and Kopriva controlled them by mowing with a sickle mower. After the weeds were under control, the grass did very well, yielding four to five tons of hay per acre. It wasn't his original plan to hay it, but with no water or fences on it, it wasn't ready for grazing. He also didn't want to graze cattle on it for a few years, especially when the soil was wet. Sod that has been newly changed from crop ground to native grasses hasn't had time to return to health. Conventional farming breaks up soil structure, which decreases water infiltration. That, along with soil microbes, needed to be restored to allow native grass roots to develop and help build the soil structure and organic matter again. Kopriva uses part of his native grass area for calving. The grass is six to seven feet tall, allowing cows a sheltered area in which to calve and bond. And it's a clean, sterile environment. No animals are grazed on it except during the calving season. Mostly, the native grass he raises is used for hay. There's a good market for native grass hay, and good quality grass hay brings a premium. Twice in the years Kopriva has had the grass he's harvested the seed off those acres. For his seed, he might make $2,000 an acre. "How many years of $15 an acre does it take to equal that?" Across the state, to the south and west, Colby LaCompte has done something very similar. The Winner, S.D. 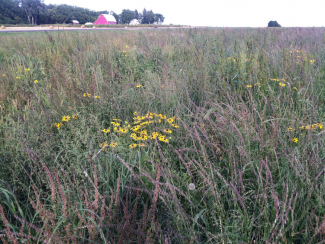 farmer decided to take about 200 acres of his farm ground and put it to native grasses. He was showing a net loss with the corn, soybeans and winter wheat he raised on rotation. So in the fall of 2016, he planted three native grasses: green needlegrass, western wheatgrass, and pubescent wheatgrass. The grass got a good start with adequate rainfall the next year, and LaCompte let it grow that year. In 2018, he hayed some of it and put cattle on some of it. He had several goals in mind. In the short term, he wanted to improve cash flow on that ground. In the long term, he needed additional feed for his livestock and wanted to eliminate soil erosion. In just two and a half years, his goals have been met. He can tell, "absolutely," that soil erosion has been diminished dramatically. He has additional grass for his cow/calf pairs, reducing overgrazing on his existing pasture, and his net return was a profit instead of a loss. LaCompte got help, in part, from EQIP, (Environmental Quality Incentives Program), a voluntary conservation program helping farmers and ranchers to promote agricultural production and environmental quality as compatible goals. EQIP is a USDA Farm Bill program administered by the NRCS. It was either rent more pasture or convert crop ground to grass, LaCompte said, and it was "more profitable to plant farm ground back to grass than pay high-dollar rent." Looking back, if he could have done anything differently, he'd have converted more farm ground into grass. "I'd do more of it," he said. Another benefit of grassland is the wildlife. LaCompte sees more pheasants and deer, and Kopriva, in his corner of South Dakota, sees more animals, too, especially pheasants. In the nearly twenty years that Kopriva has had his native grasses, he has used controlled burns to keep out the weeds. Non-native grasses move in, especially smooth brome, which he calls a thief. "It robs all the nutrients and water for the year," Kopriva said, and puts out a seed head before the wild grass wakes up in the spring. Then there is no moisture or nutrients for the native grass. About May 1, Kopriva does a controlled burn. The native grasses aren't up yet and the brome, crested wheatgrass and cheatgrass is. The burn "will really suppress the non-natives. It messes them up and they're out of the picture for two or three years." Burning doesn't cost as much as chemicals but it does require wisdom and time, and it's part of working with native grasses. "It takes more management," he said. "It's less expensive on a cash outlay basis, but it takes management and discipline to say, it's not wise to burn today." The burn is especially beneficial in the growing season before seed harvest, he says. "You can't believe how influential that fire is on the production of the natives," he said. He noted that experts believe the entire Great Plains burned, from one end to the other, although not at the same time, at least once every decade. He notes that with native grasses, the soil is doing what it was created to do, with no inputs from the producer. With farm ground, "you're buying inputs and those inputs are things that the soil should produce. We take the short cut and pour more fertilizer and chemicals on it to make it produce. It will produce if you keep it healthy and in a healthy condition." Kopriva is on the board for the South Dakota Grasslands Coalition, a group that educates people about how to learn to work with their soil, "to let it regenerate so it has greater productive capabilities and great economic capabilities, to let soil do what it was designed to do, with less inputs." Nineteen years ago, Kopriva moved away from grain production and more into hay. He planted alfalfa and grasses into his farm ground and now harvests horse and dairy hay instead of corn, beans and wheat. He has 1,200 acres in hay ground and about 100 acres dedicated to grain production. "I don't have to re-establish the roots every year," he said. His hay is sold to North Carolina, Wyoming, Minnesota and Wisconsin. Kopriva's neighbors are all grain farmers, "and they think they're making money," he said. A neighbor "told me he was sleeping like a baby," through tough financial times. "He wakes up every hour and cries himself back to sleep." "We went from conventional black dirt farmer mentality to doing the math and figuring out that it wasn't working. We weren't looking for it to make us wealthy but we were looking to relieve debt, feed the family, put the kids through college. We had expenses." The conversion from crop ground to native grassland "had to work or I had to do something else. We made those decisions for financial reasons," Kopriva said. "It was plain old not making money. We came to the fork in the road and took the one less traveled by." The South Dakota Habitat Conservation Foundation, SDSU, and NRCS are working together on a project called Every Acre Counts. The program is designed to help farmers better manage marginal ground while improving their bottom line. Four regions of South Dakota have been selected to start the project: Moody, Lake and Minnehaha Counties; Brown, Spink, Clark and Day Counties; Edmonds, Potter and Faulk Counties; and Aurora, Brule, Buffalo and Jerauld Counties. For more information on Every Acre Counts, contact SDSU or email project directors Anthony.Bly@sdstate.edu or Matthew.Diersen@sdstate.edu.